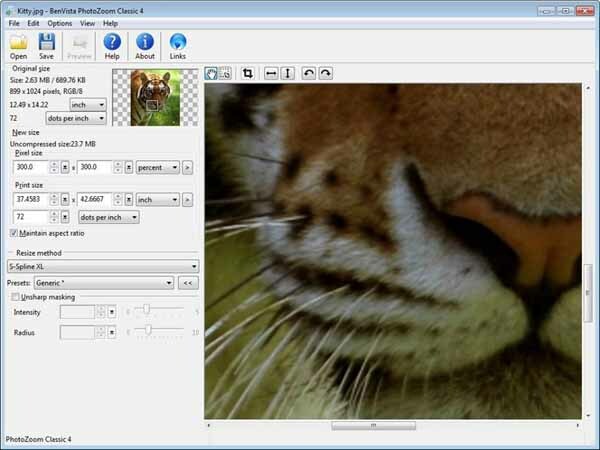 Free download BenVista PhotoZoom Classic Latest Version. PhotoZoom Classic is specialized in enlarging photos while preserving quality. Equipped with BenVista’s unique S-Spline technologies, this software easily surpasses alternative solutions such as Photoshop’s Bicubic interpolation. PhotoZoom Classic also offers a special setting for removing JPEG compression artifacts and noise. Perfect for images originating from the Internet! PhotoZoom Classic comes with handy presets that are specially designed for different types of photos and graphics. You can also create and save your own presets, using an easy set of fine-tuning tools. BenVista PhotoZoom Classic creates image enlargements of outstanding quality and is extremely easy to use. An absolute must-have for digital camera owners and anyone who wants to create great looking image enlargements.